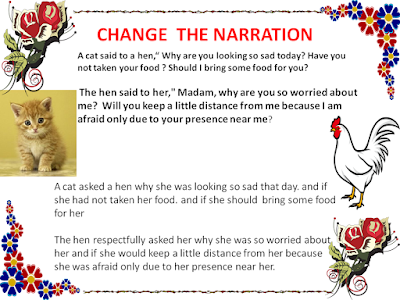 Change of Different types of sentences from Direct speech into Indirect speech. First Person in reported speech changes according to Subject in reporting speech. Second Person in reported speech changes according to object in reporting speech. Third Person in reported speech does not change. ‘You’ is second person. It will change according to object ‘me’. ‘My’ is First person It will change according to Subject ‘He’. ‘Her’ is third person It will not change. He asked me if I would convey his message to her. Interrogative sentences are of two types. A. First starting with helping verbs like is, am, are, were, was, had, have, shall, will or would etc. In such sentences, the sentence is changed to from interrogative form to assertive sentence. The helping verb is shifted to its normal place as per assertive sentence and is further changed as required. Subject and object in the reported speech are changed according to rules. The sign of interrogation is removed and it is substituted by full stop. Comma and Inverted commas are replaced by the word ‘if ’. The sentence will change as: Interrogative will change into assertive. Interrogation mark (?) will change into (.) Full stop. Further , “ ” will change into if. You is second person. It will change into object of reporting speech. There is no object in reporting speech. So it will not change. Are will change into were and now will change into then. He said if you were well then. Now a sentence with an object in reporting speech. ‘you’ is a second person. It will change according to object i.e. ‘me’. Similarly ‘are’ will change into was. He asked me if I was well then. You is second person it will change according to object him. Are will change into was (according to he). I asked him if he was well then. ‘Said to’ will change into asked ” ” = if Past tense of will = would. You and your are second person and will change according to object him. Me is first person and will change according to She. She asked him if he would lend her his book. Here ‘Do take ‘ in interrogative sentence = Take in assertive sentence. Past tense of take = took. You is second person and will change according to object ‘her’. The doctor asked her if she took any medicine. The lady said to us, “ Did you attend the party yesterday? Did attend in interrogative sentence = attended in assertive sentence. Attended will change into Had + Third form or Had attended. You, Second person will change according to object us. Yesterday = the previous day. The lady asked us if we had attended the party the previous day. Boys asked the teacher if he was not going to teach them that day. The lady said to us, “ Will you attend the party today? The lady asked us if we would attend the party that day. She asked me if he was an honest man. The boy asked the shopkeeper if he sold sweets. The fox asked the crow if the grapes were sour. The father asked his son if he heard a noise. John asked his friend if he had not gone to his office that day. He asked the passerby if he needed his help. She asked me if he had invited me to dinner. You asked her if she would come to your house that day. The student asked the teacher respectfully if he might go home. She asked her if she could solve her problem. He asked you if it was not a surprise for him. She asked the boys if they had gone to play a match. My mother said to him, “Will you help me in this matter? My mother asked him if he would help her in that matter. I asked her if she would keep quiet for some time. B. The second type of interrogative sentences are which start with words like – What, Which, Why, Who, Whose, Where, When, how and whom etc. In such sentences, ‘said to’ is changed to ‘asked’. The interrogative sentence is changed into an assertive sentence and the sign of interrogation is removed and is substituted by full stop. Comma and Inverted commas are removed without using any word in their place. My mother asked her how she felt then. She asked the stranger who he was. I asked Mohan how long he would stay with us. She asked him which his book was. He asked me where I wanted to go. The father asked the child why he did not speak the truth. She asked me who I was and where I came from. The police asked the thief what he was doing there. She asked her husband when he would leave for his office. He asked me when I was leaving for Delhi and if I would take him along with me. The official asked the visitor what he wanted and if he did not know that office was closed on that day. His wife asked him if he was leaving for his office then and when he would return home in the evening that day. The old man asked the boy why he was beating that child and if he had not any sense of shame.